(Newser) – An enterprising dog is being reunited with her owner five weeks after she was presumed lost at sea. 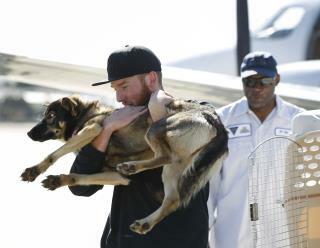 Luna's tale begins on Feb. 10, when the 18-month-old German shepherd somehow went over the side of owner Nick Hayworth's fishing boat as he was pulling in lobster traps, reports the AP. He fruitlessly searched the waters off San Clemente Island, a Navy-owned training base near San Diego. He also notified Navy authorities, who did the same. Luna was presumed dead—right up until the moment Navy staff arriving for work on the island Tuesday spotted her by the side of the road. Great story. I'm glad Luna survived. That will make for 1 happy man upon coming home!